Chris Gimenez pitched to Eduardo Escobar. That about says all you need to know about this game. Hector Santiago gave up a three-run homer before recording a single out. The sound of TV sets being turned off could be heard across all of Twins Territory. 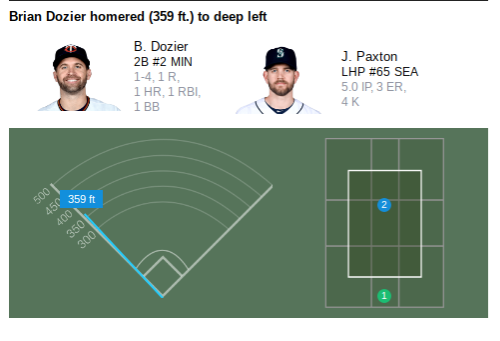 Those diehards who watched the rest of the game were "treated" to some more fireworks by the Seattle offense, as the Mariners continued to pound the Twins. Santiago did not look right from the get-go. 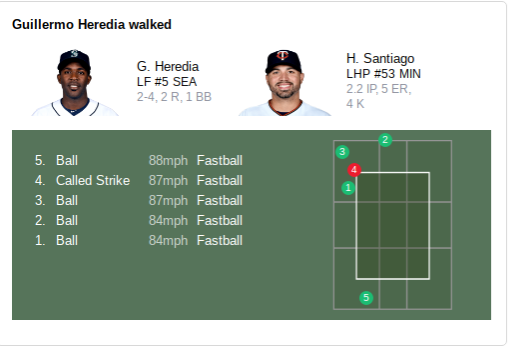 Below is a visual on how he fared against the first batter of the game (via Yahoo), the location is obviously an issue, but note the velocity, as well. The new guys out in the bullpen had ugly games. Randy Rosario gave up five earned runs in 0.1 IP. His ERA is 30.86. Alex Wimmers managed to get five outs, but he also gave up a pair of runs. Byron Buxton was 2-for-4 with a double and saw 19 pitches. Mejia has been solid in three starts since returning from Rochester, lowering his ERA from 5.79 to 3.95 in the process. Current Twins have hit .359/.450/.516 off Gallardo over a combined 81 PAs. Click here for the minor league report for Tuesday's games. What is it that Gimenez throws? Is that a knuckle curve or something? It looks so slow that maybe I could hit it. 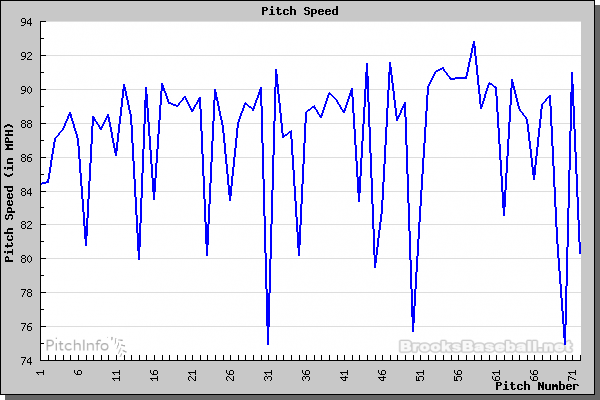 Not sure, but it looks like per Brooks Baseball his first pitch was 50 mph Maybe he was just trying to float the first one in there to make sure Escobar wasn't gonna have a heart attack. There's no way Rosario doesn't get sent back down after that performance, right? Or does he hold down a spot for low leverage situations until Hughes or Haley (gaah!) comes back? Fans have ripped on the bullpen but to me the last 5 games have been a microcosm of the season. We have been out scored 28-23 which means we are guaranteed losing one game and conceivably losing all 5. Instead we have two blow out losses, one blow out win and two close wins. 3-2 record because we won all the games we had a realistic job of winning and lost two blow outs. Bullpen did a great job in the close games and got destroyed in the losses. Of course I would rather have tons of depth and quality in the bullpen and have them give us a chance to come back when the starters dig a big hole. We are 29-25 when we should be 24-30 based on run differential. ERA is high and depth isn't there but aside from the two games in a row last week the bullpen has been quite solid when it matters. When it doesn't matter the runs have piled up. I am fine if that trend continues. Great article format. Love this. Nice work Tom! In Phil Miller's write up, Santiago says he was aiming the ball trying to get strike 1 instead of pitching. I could believe that, as he was trying different arm slots and velocities to make something work last night. Somehow the guy needs to reset his brain and get back to pitching like he was earlier in the season. Easier said than done when your confidence is shot, and you think every LH hitter is going to send your pitches to outer space. Remember when we wanted to extend Santiago? Pretty remarkable that a team can be in first place 1/3rd of the way into a season while having one of the worst run differentials in the AL and posting 4 pitching appearances from a position player. How long can this really be sustainable? Tom, I want to marry this story. And the worst ERA in the AL. Lately, they either win, or they lose by 10 runs. 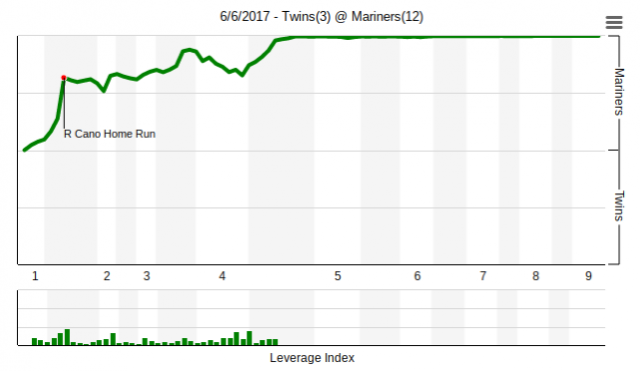 I love the presence of a Twins' game write-up! That's the one thing that has been missing from TD and I hope it becomes a regular feature. When I can't watch a game I sometimes feel better informed about the minor league games than the majors, but a nice write-up of the Twins's game fills that void nicely! thanks guys. I'm going to try to whip up something similar for every game. I'm obviously either crazy, a fool ... or a crazy fool. We'll see how it goes. I think that we have seen enough of Santiago, Wimmers, and Rosario.Santiago can be the long man and replaced in the rotation by Turley;Melotakis can replace Rosario and Busenitz, Wimmers. I thought the same thing. The pen already has 4 lefties, and I'd like to see Busenitz, Hildenberger, or Curtiss get a shot. I know Santiago's struggling, but we can't make him the long man - that should be Hughes' job when he gets back. Not to mention Gibson should be in AAA. There just aren't any other options to replace Santiago with (Turley is a AAA lifer, don't think he'd be an upgrade). Is it my imagination or do the Twins pitchers have a much better track record with Castro behind the plate than Gimenez? I couldn't find an ERA stat between the two but it just seems like that when Gimenez catches, the pitching staff struggles. 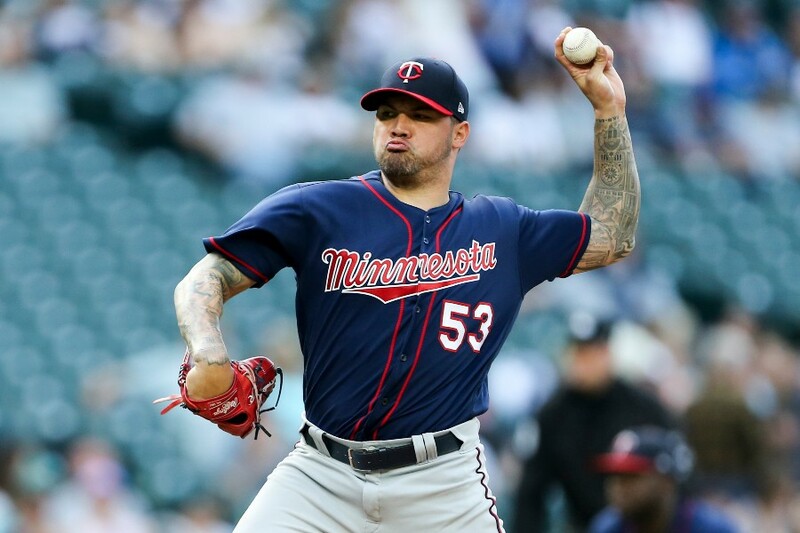 I know the Twins really like him so may be he could stay as the backup 1B/3rd C with Murphy or Garver coming up although that then leaves no room for Vargas. I'd take Turley over Santiago without hesitation. Indefinitely. If the run differential is created by the lopsided losses then the only performances that count are the starting pitching and and the relievers who come in when the game is close. Right now we have three starters that have ERA's under 4 which has only happened once in the last 7 years. Not coincidentally that year was 2015 when we had the winning record. If the quality starts are spaced out in such a way that does not tax our depth then the only ERA's by relievers that matter are Kintzler, Duffey, Rogers, Boshers and Breslow. Who cares if Rosario has a 30 ERA if it is created by giving up 5 runs when we are already down 6? Of course, nothing is spaced out perfectly so it would be really nice to get another 2 relievers on whom we can rely but so far the quality starts have been matched up with the quality relief pretty well. Dare we give Molitor some credit for that? I am against judging young guys by two appearances but it looks like a couple of guys are as deserving or more deserving of being given the chance anyway. I wonder why Rosario leapfrogged the three you mentioned and maybe a couple others as well. If this is going to be a thing now - sign me up. This is awesome. Love the format and the insights. If you keep writing game recaps, I'll keep reading!